To celebrate International Women's Day, we decided to raise a glass to the women in our own backyard, pioneering change and trailblazing in a male-dominated industry – food. We're spoiled for choice here in New Zealand. From the bountiful fresh produce, stunning panoramas and world-class wine industry, Kiwis have it pretty good when it comes to culinary offerings. Yet, unbeknown to most, the commercial kitchen and restaurant game is still very much so a boys club. The notoriety, the endorsements, the book deals, have previously been reserved for the men – with a few notable (and kickass) exceptions. Here are 10 impressive Kiwi women breaking the mould and doing it that much better. One half of the dynamic sister duo behind the deliciousness that is K-Road stronghold Coco's Cantina, Damaris Coulter is a force to be reckoned with. The passionate restaurateur boasts one highly-entertaining Instagram presence and can lay claim to one of the city's most beloved restaurants. Add to this her work on her website and soon-to-be app, The Realness – a platform to raise global awareness for single owner-operated restaurants – it’s going to be a big year. One of our favourite hospitality heroines and undisputed brunch queen Fran Mazza (Winona Forever, Hello Friends + Allies, Major Tom) is one busy business woman. With three more cafes opening, Sugar at Chelsea Bay, then Sale St and Three Kings to follow by the end of the year, Fran's sights are next set on a cookbook. Accomplished Kiwi chef Monique Fiso started Hiakai after returning to New Zealand in early 2016, following seven years in New York (including three at the Michelin-starred Musket Room where she fed everyone from Robert de Niro to Bruce Springsteen). Hiakai is Māori for hungry, which the impressive chef most certainly is. But with a twist: think paua porridge with celery cream and puffed wheat, boil-ups studded with pork bones and doughboys, and the much maligned rotten corn which, minus the whiffy smell, has morphed into a sweet ice cream. Hiakai’s centrepiece is a hangi, which involves the usual hot rocks and hours of waiting around, but in Monique’s world the food comes encased in ferns, rangiora leaves and paaro (harakeke) baskets she taught herself to weave. It's safe to say that anyone who has dined at Auckland restaurant Apèro Food and Wine would agree that chef Leslie Hottiaux's food is world-class. It's one of our favourite spots to grab a bite of incredible French-inspired food (alongside a glass of beautifully matched wine, of course). In 2016, Leslie’s talent saw her recognised as one of the best young chefs in Australasia. We can attest (after many taste tests) that Leslie's food is in a league of its own. Recipe developer, food blogger and one-half of The Next Meal, Jane Lyons is a star on the rise. We're no stranger to Jane's epic and edible creations, with big things on the horizon. Keep an eye out for Jane's delicious desserts in the next issue of Dish. With a wildly-successful blog, instantly recognisable aesthetic and now a cookbook, Sarah Tuck has long-reigned as the culinary queen of cool. Last November, guests joined Sarah and the Dish team for an innovative afternoon at Fisher & Paykel. Dish readers enjoyed a masterclass in food styling, photography and the art of perfecting the summer menu. We don't doubt there's much more to come. Single-handedly saving us from tempting takeaways on lazy weeknights, Underground Kitchen's Jess Daniell has created herself a budding empire. 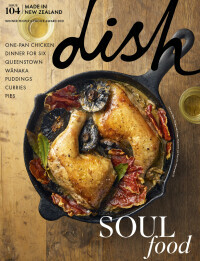 With two Auckland sites and big plans to continue growing, be sure to pick up a copy of her easy-to-follow cookbook, fit for every skill level. Jess' ready-to-heat take-home meals, healthy baking, seasonal salads, cabinet food, artisan deli goods and great coffee have made her a fast-favourite among hungry locals. We're pretty proud to claim recipe queen and Dish food editor Claire Aldous as our own. With more than 15-years experience at the helm, it's safe to say former Dish editor Lisa Morton put it best – Claire is a "national treasure". From easy everyday, weeknight meal solutions, to celebration menus to savour with family and friends, Claire's extensive food knowledge and versatility make her a star. Plus, the weekly office baking certainly helps. Queen of green and mum-of-two, Kelly Gibney, has been making Meat-free Mondays bearable since way back. With a gorgeous cookbook, successful blog and delicious backlog of Dish recipes to her name, Kelly's vege and vegan options are our saving grace. If you're a foodie on Instagram, chances are you've heard of The Hungry Cook. Expect big things from food blogger Olivia Galletly, with an impressive (and steadily growing) online following, self-styled food-grams and regular contributions to Dish. Olivia makes jaw-dropping meals easy and achievable, whatever your budget.